Orlando Gonzalez helps keep Pomona palatial. 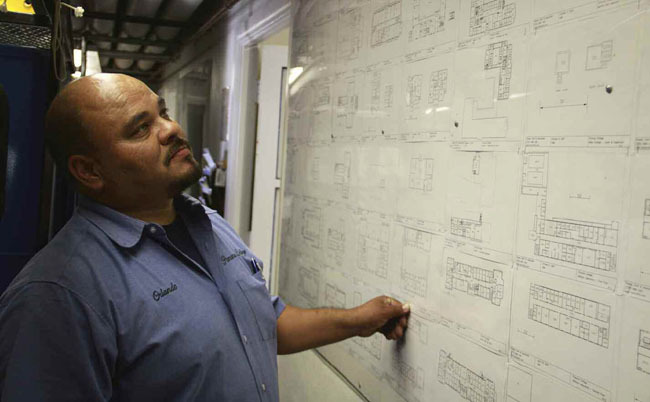 Maintenance Shop Supervisor Orlando Gonzalez is a hands-on kind of guy, working alongside his five-person crew on everything from unclogging shower drains to replacing shingles. But it’s his mind and his memory that are key to keeping the campus in tip-top shape. Friday afternoon, when other workers might be winding down, is when those get-it-off-the-list work orders flow in fastest. Even summer is no vacation: they bring in extra workers to sweep through every dorm room and make repairs that can’t be done during school. They do, however, get together for a bonding lunchtime barbecue every few weeks. Gonzalez is always looking for a better way. For a time, the College was paying $800 a pop (ouch) to replace damaged security card readers; he worked out a method to only spend $100 to replace just a part. Still, Gonzalez and crew can’t do it all, not on a campus with 63 buildings, and so he also oversees the work of various contractors, from painters to gutter cleaners. They’d better do it right. If a contractor is getting called in for a repair that’s been done before, he’s going to recall it and go back to check his paper stack of work orders he keeps for the last 10 years. “We need stuff fixed,” Gonzalez says.